Puerto Rico sits in the northeast corner of the Caribbean, nestling between the Dominican Republic and the Virgin Islands. As you would expect, Puerto Rico boasts some picture-postcard beaches. Playa Flamenco on the island of Culebra is regarded as the finest beach in the Caribbean, with a mile long stretch of immaculate white sand and the iconic rusting tank remains on the western end. Beneath the crystalline waters, you’ll see vibrantly coloured coral reef and a huge variety of tropical fish, making it a paradise for snorkelers and divers. Surfers should make their way over to Rincon on the main island’s northwest corner as it produces perfect waves ranging from 2 to 25 foot in height. 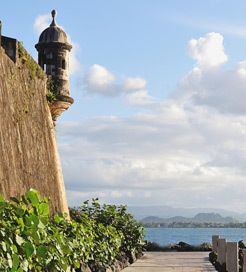 Puerto Rico has a rich history, too. It was originally inhabited by the aboriginal Taino people but was later claimed by Columbus in the 15th Century. It then endured several invasions from the French, Dutch and British, resulting in a European-influenced cultural and physical landscape today. Evidence of the country’s tumultuous past can be seen in San Juan, the capital and largest city. Looming over the bay is the magnificent El Morro, an old Spanish fort with walls reaching 140 foot and dating back to 1539. The town of Old San Juan is an architectural masterpiece in itself, with rows of colourful colonial houses lining countless narrow streets, so remember to bring a camera. A day of sightseeing and riding waves can work up an appetite, so you’ll be pleased to know exquisite meals are easy to come by. Plantain is one of the most prominent ingredients in Puerto Rican cuisine and one of the most popular dishes is a paella-style pork with rice and roast suckling pig, meaning there’s something for everyone in this beautiful country from food lovers and beachbums to avid historians. There are a couple of ferry routes from the neighbouring country of Dominican Republic to choose from. There are a few crossings each week from Santo Domingo to San Juan in the northeast and slightly less frequent crossings to Mayaguez on the west coast. For more information, please visit our Ferries from Dominican Republic to Puerto Rico page.